Arizona State Parks & Trails offers a variety of employment opportunities. Those interested in park operations may consider a park ranger, park manager, or regional manager position in our 35 state parks & natural areas. Arizona State Parks & Trails also has seasonal requirements for temporary park rangers. Professional, administrative, and technical opportunities are available in the Phoenix office for those interested in park development, public information /relations, research and marketing, administration services, grants and recreation programs, resource management, outreach programs, and State Historic Preservation Office positions. All State of Arizona government jobs can be found at one site: http://www.hr.az.gov/AZStateJobs/. You can search for current job openings by job description, keyword, job type or job name. At the site, you can create an account, upload your resume and apply for current vacancies. This is the only method to apply for jobs with Arizona State Parks and Trails. If you wish to only view and/or apply for Arizona State Parks jobs, search by agency: Parks, Arizona State. Selection: Resumes submitted through AZStateJobs.gov will be evaluated by Arizona State Parks and Trails recruitment staff and referred to the hiring supervisor. Should qualifications match that of an open position, the resume may be forwarded to the hiring authority for consideration. You will be contacted only if the hiring supervisor wishes to pursue your background further. A valid Class D Arizona driver's license is required at time of appointment for most jobs. All relevant information is subject to verification. Location: Most parks are located away from the major urban areas of the state. Please review our Arizona State Parks map for locations. For more information, visit the Arizona Peace Officer Standards and Training Board. Listed below is information about benefits offered to permanent full-time employees of Arizona State Parks and Trails. Details concerning eligibility and additional information are provided to new employees upon hiring. Annual Leave: Annual leave includes all periods of approved absence with pay, which are not chargeable to another category of leave. Annual leave time accrual rates differ for covered and uncovered employees, as shown below. Sick Leave: Leave is accrued at the rate of 3.7 hours per pay period, or 12 days per year. 16 hours may be granted to attend a funeral out of state. Health Insurance: The State offers comprehensive health care coverage to eligible employees through a self-insurance program. The type of coverage for the current plan year is chosen by the employee at the time of employment. The State pays the major portion of the premiums for employees and dependents. Since the health insurance is part of a flexible benefits program, employee premiums are on a pre-tax basis. Dental Insurance: Dental insurance is available to eligible employees and dependents, with premiums paid on a pre-tax basis. Employees may select dental insurance for themselves and their dependents through an indemnity plan or a pre-paid plan. Avesis Vision Care: Optional. Premium fully paid by the employee. Employee Wellness Program: The BeWell Wellness program offers free or low cost services and programs such as mini-health screenings, flu shots, and health management education courses. Also provides employee assistance and online resources. Retirement: The State has an excellent retirement program. An annually adjusted percentage of your gross wage is deducted on a pre-tax basis and matched by the State as contributions to your retirement fund. Mandatory participation in the Arizona State Retirement System unless eligible for The Corrections Officer Retirement Plan (CORP) or The Public Safety Personnel Retirement System (PSPRS). Deferred Compensation Plan: Optional 401K-type program. Standard Short-Term Disability: Optional. Premium fully paid by the employee. Standard Life Insurance: $15,000 of basic life insurance for all eligible employees, paid by the state. Employees may purchase additional supplemental life insurance coverage. Standard Dependent Life Insurance: Optional life insurance is available for spouse, domestic partner and eligible children. Flexible Spending Accounts (FSAs) – Medical and/or Dependent Care: Allows employee to set aside pretax dollars to pay medical expenses or out-of-pocket childcare expenses for dependents under the age of 13. You specify the annual dollar amount of your earnings to be deposited to each account. Minimum and maximum contributions apply. Enrollment in an FSA must be completed within 31 days from the date of eligibility. Credit Union: State employees and dependents are immediately eligible to join a credit union. Credit unions provide many benefits at low costs, and can offer sound financial planning advice to you and your family. Depending upon the agency for which you work, you may become a member of Arizona State Credit Union and/or Canyon State Credit Union. Employee Rights: State service is strictly governed by a set of personnel rules based on merit system principles. The Arizona State Parks Board is an Equal Opportunity, Reasonable Accommodation Employer. If you need additional information please call (602) 542-6900 or 542-6919. For your benefit, we have provided information on the employment application procedure and benefits for full-time employees. Visit http://www.hr.az.gov/AZStateJobs/ for additional job openings. Search by agency Arizona State Parks. The mission at Arizona State Parks and Trails is managing and conserving Arizona’s natural, cultural and recreational resources for the benefit of the people both in our parks and through our partners. 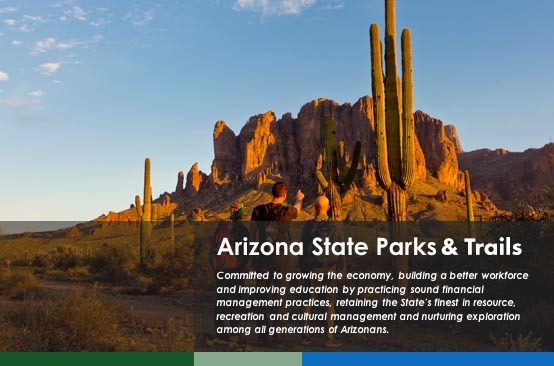 Our vision is for Arizona State Parks and Trails to be indispensable to the economies, communities and environments of Arizona.